Doctors in Kenya's public hospitals on Wednesday October 3 spent their 17th day on strike to protest the dilapidated state of public health care. Emergency rooms in some of Kenya's public hospitals frequently don't have gloves or medicine, and power outages sometimes force doctors to use the light from their phones to complete a procedure. 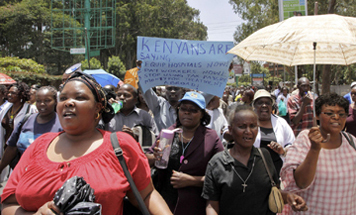 Kenya's government fired 1,000 of the 2,000 striking doctors last week despite a shortfall of skilled medical practitioners. The government had promised to implement reforms in health care last year after doctors walked off the job and held protests. Dr. Fredrick Oluga, told The Associated Press how in mid-August he was called in to help remove the placenta from a woman that was stuck after she had just given birth. Oluga said that that when he arrived there was no electricity at the Vihiga district hospital in western Kenya and the standby generator did not have fuel. And the hospital did not have gynecological gloves for the procedure, he said. Health care has been in a deplorable state in Kenya for a long time, but the country's poor — and many in Kenya — think the state of health care is the norm, said Bosire, the Nairobi branch chairwoman of the Kenya Medical Practitioners, Pharmacist and Dentist Union. Bosire said middle class and rich Kenyans do not realize the problems in public health facilities until they are forced to seek treatment there when treatment in private hospitals becomes too expensive. Public hospitals charge far less than private hospitals, where politicians and top government officials seek treatment, Bosire said. The two top health officials in the country, Medical Services Minister Anyang Nyongo, who fired the striking doctors and has refused to negotiate with the union, and the Minister for Public Health Beth Mugo, spent months in the U.S. for cancer treatment last year at the taxpayers' expense, Bosire said. Doctors want the government to spend more money on health care, including hiring more workers. International advocacy groups have repeatedly criticized Kenya for not investing enough in health care. The World Health Organization says Kenya and several other countries in Africa have not met a pledge made in 2000 to increase their health budgets to 15 percent of their national budgets by 2010. Kenya, East Africa's biggest economy has set aside 6 percent of the total budget. Rwanda, by comparison, allocates 18 percent of the total budget to health care, Bosire said. Mwalimu Mati, an anti-corruption crusader, says the health care funding shortfall is caused in part by non-essential government spending, like international and domestic travel by government officials. Kenya recently inaugurated a newly refurbished parliament chamber where each of 350 seats cost $3,000.